I feel like just a second ago I was talking about how much I love spring, English peas and radishes, and now? Summer is almost here! I know it’s not technically summer, but Memorial Day always seems like the kick-off to the new season, doesn’t it? Summer for me means grilling all the time; and not just on weekends or on summer holidays, but grilling on random weeknights, too. This recipe is perfect for just that! 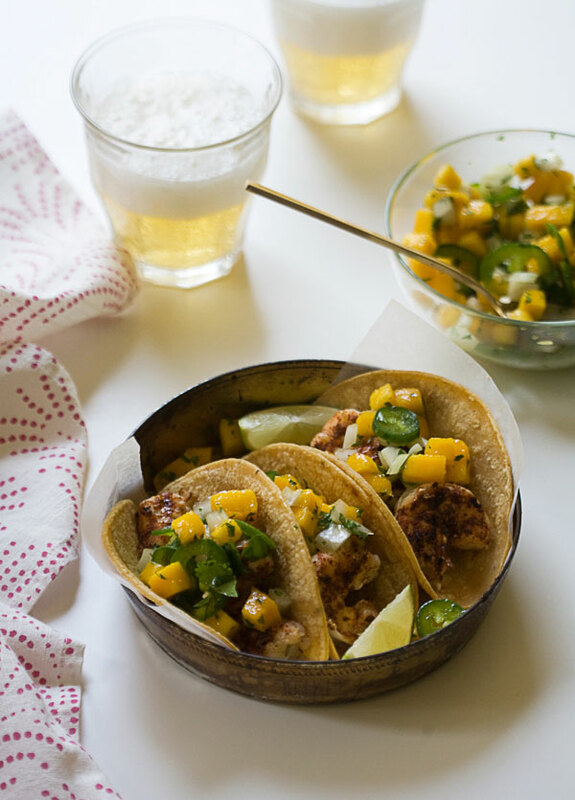 My mom’s go-to, super quick and easy weeknight meal for us was tacos. It made it simple for her: she’d chop up a bunch of stuff, cook some chicken or protein and allow us to assemble everything. This recipe is ideal for letting people assemble their own. The shrimp cook in mere minutes and the mango salsa takes about 10 minutes to throw together (there’s a good amount of chopping). 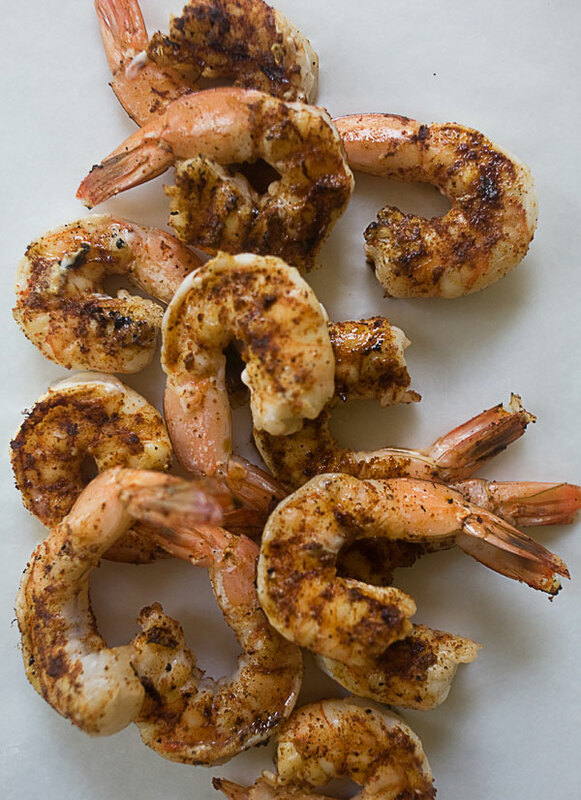 I love the combination of the spices on the shrimp. 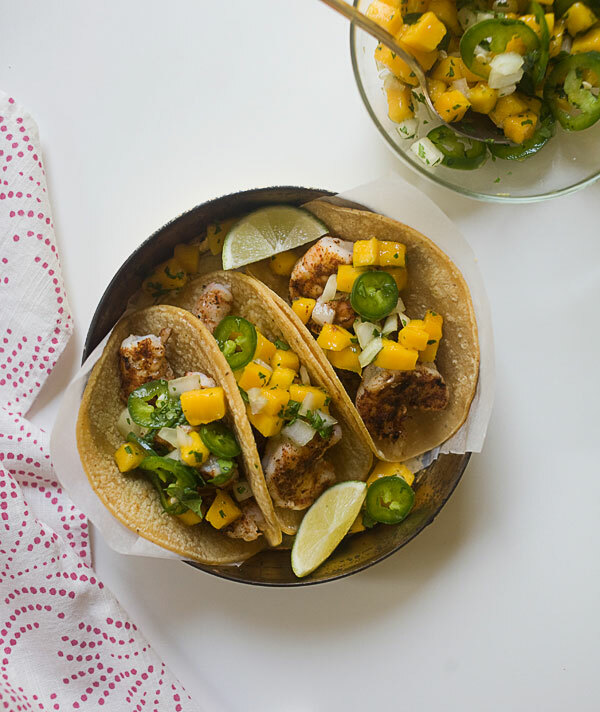 And the mango salsa has a nice balance of sweet, tangy and spicy. Happy almost-summer! 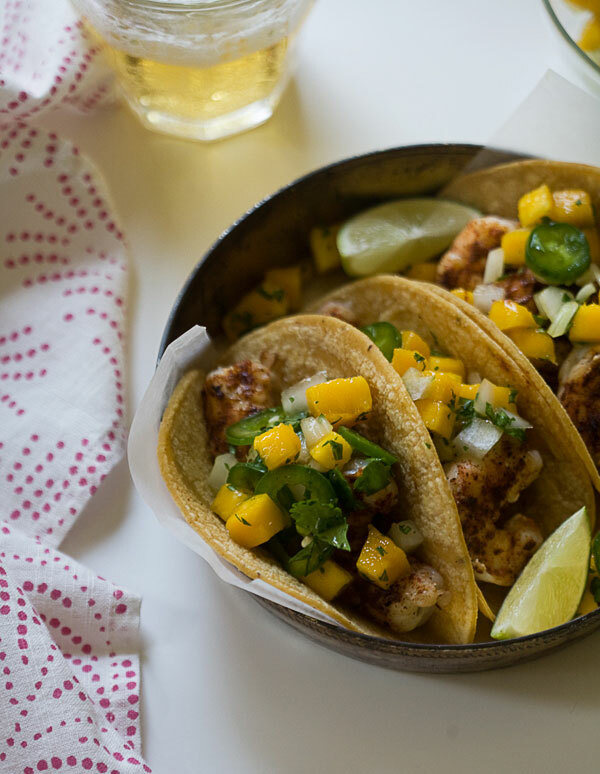 Combine grilled shrimp and mango for a summertime taco. People can assemble their own combinations. Preheat your grill or grill pan over medium heat. In a medium bowl, mix together the cubed mango, jalapeño, cilantro, white onion, juice from 1 lime and a few pinches of salt; set aside. In a small bowl, whisk together the ancho chile powder, ground cumin, smoked paprika and salt. Sprinkle the spice mixture over the shrimp, being sure both sides are thoroughly coated. Brush the grill or grill pan with a bit of oil to prevent sticking. Transfer shrimp to the grill and cook on each side for about 2 minutes, until the shrimps turn pink and opaque. 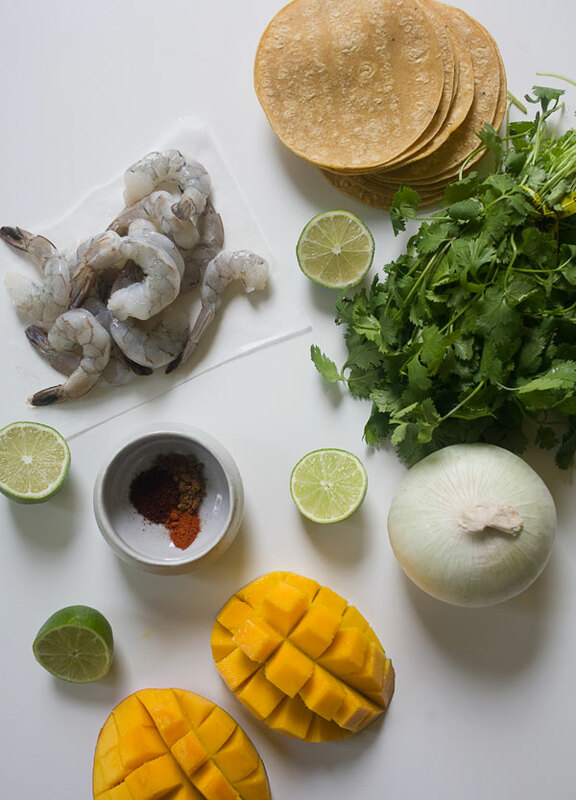 To serve, divide the shrimp amongst the tortillas, placing about 2-3 shrimp per tortilla. 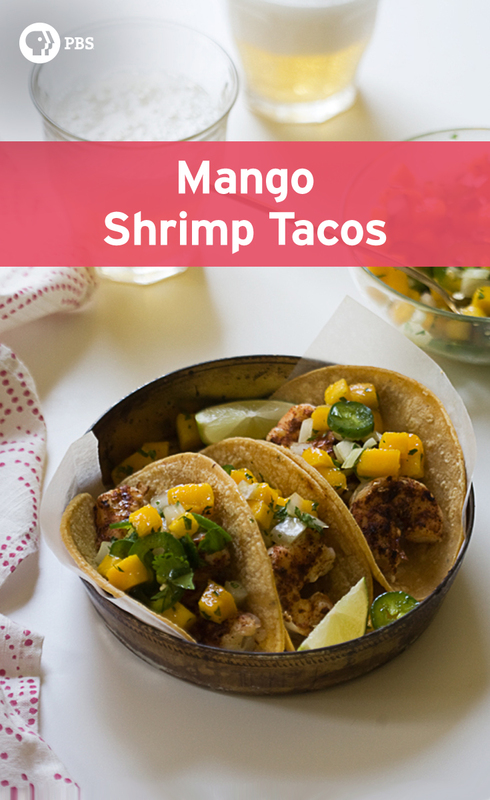 Top with a few tablespoons of mango salsa and an extra squeeze of lime.